Gait4Dog Gateway Walk System | It's Possible! What is the GAIT4Dog walkway system? Well, to put it lightly, it’s the most technological and complex carpet you will ever let your dog walk on:) lol. The It’s Possible Walkway is 12’ of seemingly ordinary carpet that houses 1/2” square pressure sensors that when paired with the Gait4DOG software become a very valuable and informative tool to evaluate gait in dogs. Data obtained by simply walking a dog across the carpet yields parameters such as; step length, stride length, step/stride ratio, reach, stance time, as well as stance and pressure percentages. If that’s a little too nerdy for you to take in, then looking at the GLS or gate lameness score may help. The GLS is comprised of all the data collected and can help evaluators and owners/handers better understand a qualitative degree of lameness or soundness. 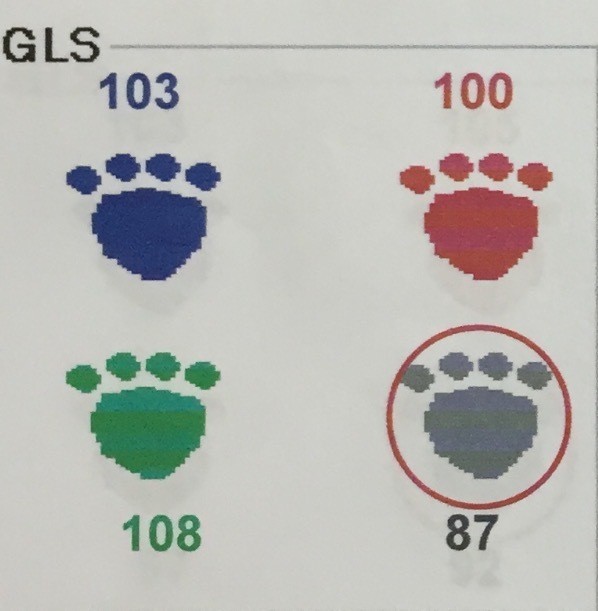 In a perfect world the GLS score would be 100 for each limb. Check out the picture below, we can see that this dogs right rear limb appears to be lame. We can also see how he may be compensating, as it looks like he is shifting weight to his left contralateral limb as well as his front. Dogs in general, but especially performance dogs can be evaluated for soundness and put the minds of their handlers at ease, but also hone in on potential problems before they become truly clinical to the naked eye. Obtaining data is fairly simple but as many variables should be controlled as much as possible. Some variables may include; walking on a loose lead, staying at a consistent speed, minimal head turning or repositioning, and staying on the carpet. Most dogs do very well with the process and pattern quickly to what the handler asks of them. How does it Benefit the Rehabilitation Patient? Creating baselines for patients recovering from surgery or injury can be very helpful in making sure treatment is working and there have been no set backs during their rehabilitation. It can also help pick up subtle changes and compensations that may be occurring so that the practitioner can better make decisions on how to target treatment and/or exercise. How does it Benefit the Canine Athlete? Many canine athletes suffer from small soft tissue injuries that go unnoticed until they are clinical. At that time longer rest periods and possible treatment may keep them out of their game and not having any fun at trials. Having normal baselines is beneficial in giving the handler confidence that their teammate is sound and ready to compete. It may also be helpful in comparing values if something were to occur. GAIT4Dog analysis has changed how I practice. Every dog that I work with in clinic is first walked on the walkway so that we can tract progress and make more informed decisions about how we should proceed. Keep an eye out on my events page for when I may be visiting your town with the GAIT4Dog Walkway!